Oh, by the way, when I posted about the LotFP game I ran last Sunday for Free RPG Day, I neglected to post about the rest of the event, which happened at Dice Latte in Seoul. After all, I didn’t just run a game: I also played in one. I guess the comparisons to the Fria Ligan game are maybe unfair, but I bet they’re common. After all, both games are drinking from the same nostalgic well, and are designed to tell stories inspired by the same (cinematic/literary) genre, right down to them both being set in the 1980s. There are other differences, though: Tales from the Loop has a unique Swedish angle (though, of course, it includes a setting for U.S. play), whereas Kids on Bikes is very, very American. Also, I think the latter is more apt to be used for pick-up-ad-play games, with no prep: I have trouble seeing a GM run Tales from the Loop with zero prep at any point. Bikes doesn’t seem to take quite as seriously as Loop the weird/strange conceits of its setting, and seems to be focused on flexibility of tone, mood, and narrative structure. As for how it went: it was definitely fun. It struck me as really, really improvisatory for the GM: one of the people who played in my game, John Campbell, ran our session, and impressed me with his ability to weave a story basically off a couple of ideas in the back of the book, plus the rumors we were prompted to share at the beginning of the game. Our scenario was basically a bunch of kids (linked by various antagonisms and friendships) and a new-in-town park ranger stumbling upon a feral child claiming her “parents” needed help, getting caught in a secret government manhunt for the child, and struggling to get her back to those parents, who turn out to be sasquatch-like aliens who crashed on Earth and, while trying to rebuild their ship from fragments and pieces over the last decade, raised her in the woods. But really, the story was as much about how character interplay: how the rich girl whose dad owned the mall felt guilty about leaving another kid in the woods (he came back, well, “different”) and despised the nerdy girl that the local teen-cynic boy (my character) was somehow friends with. Three hours was maybe a bit short for the amount of connective tissue needed to link together all our rumors into a single story (and John did end up fast-forwarding the story a couple of times, in the places where hiking montages would have gone in the cinematic version of such a tale), but it felt like a good length of session for the game, nonetheless. 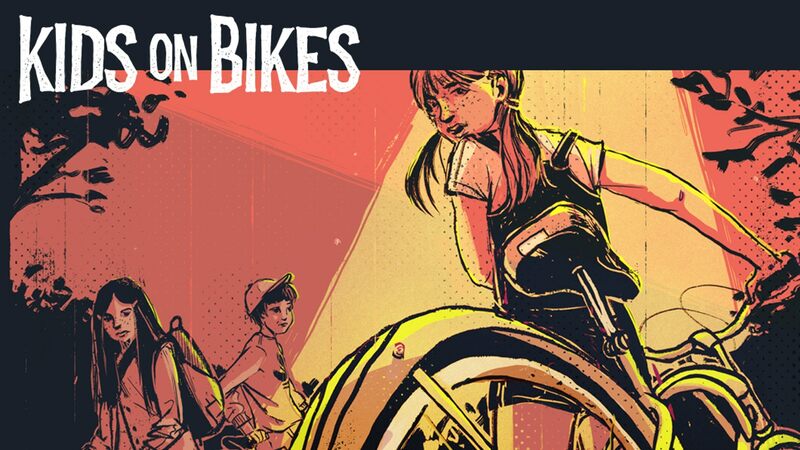 I missed Kids on Bikes on Kickstarter: I was on the fence about it then, and though I didn’t rush out and add it to my to-get-immediately list, it did go on my long-list of maybe-sometime games. It’s still on the list, after having had a chance to play it: the system seems simple enough that one could probably run it just using the Quickstart and have fun, and while I think running a few sessions of it would probably help me stretch mental muscles that get less of a workout in the sorts of games I usually play these days, I suspect that’s probably true of a lot of games. That said, I think it’d be especially fun to run this game with a group of kids as players: they’d probably have a ball running sulky teenagers and goofy adults, as well as running kids who’re authentically smarter than we adults usually give them credit for. Besides that, I also picked up a few other nice Free RPG Day books. I won’t inflict a photo of them on you, since I’ve shelved them all, but you can see the titles/covers here. I’m especially interested in the Cthulhu Confidential/Fall of Delta Green scenario book, since I have a copy of Cthulhu Con fidential (the one-on-one Gumshoe-system game) and had been hoping to run it for my wife at some point. It looks unlikely that that’s going to happen this summer, but someday… someday. And what do you know, but the day after the event, my Kickstarter-backer copy of Legacy: Life Among the Ruins 2nd Edition showed up at our place in all its lovely hardback glory, along with the boxed set of alternate settings and a couple of other nice add-ons I don’t at all regret picking up. I’ll be too busy to look at much of any of this stuff for the next few weeks, though. More about why next time… if I feel like posting about it, that is. I might not until afterward, or at all. Still processing things.